The price you found is 11% lower than this hotel's average rate of $233/night. We were on a budget for our travels in northern Vietnam, so this place was a splurge for us. After a mildly disconcerting speedy drive to the lodge, we were a bit chagrined to find on check in on the additional $13 per person charge for dinner. My friend did the booking and didn't recall seeing mention of that-- but for the $155 room price we assumed that all meals were included. There was not a lot of choice involved in this for the first night- and the volume of food was way too much. We ended up bringing one of the courses back to the minibar fridge and having it for dinner the next night. One option for management to consider is a "small set" versus a "large set"- in that case, we may have had dinner in the dining room on both nights. We also passed on a $60 day hike. Instead, we packed a sandwich from the fantastic breakfast buffet and went walking from the lodge. The Red Dao ladies did a masterful job of kindly escorting us down to Ban Ho and then back up again for a very modest $5 per person and a purchase of one of their handmade bags. That experience was the of the highlight of our time in the region. To do this, you'll need to be in decent shape as the trip back up the hill is long and hot-...We were on a budget for our travels in northern Vietnam, so this place was a splurge for us. After a mildly disconcerting speedy drive to the lodge, we were a bit chagrined to find on check in on the additional $13 per person charge for dinner. My friend did the booking and didn't recall seeing mention of that-- but for the $155 room price we assumed that all meals were included. There was not a lot of choice involved in this for the first night- and the volume of food was way too much. We ended up bringing one of the courses back to the minibar fridge and having it for dinner the next night. One option for management to consider is a "small set" versus a "large set"- in that case, we may have had dinner in the dining room on both nights. We also passed on a $60 day hike. Instead, we packed a sandwich from the fantastic breakfast buffet and went walking from the lodge. The Red Dao ladies did a masterful job of kindly escorting us down to Ban Ho and then back up again for a very modest $5 per person and a purchase of one of their handmade bags. That experience was the of the highlight of our time in the region. To do this, you'll need to be in decent shape as the trip back up the hill is long and hot- humbling too as the gals were doing the whole thing in plastic sandals. The price you found is 11% lower than this hotel's average rate of $19/night. Stayed 1 night. Loved the location. High up in mountains. Modern bathroom, spacious room in individual lodge. Amenities in bathroom limited, so don't forget toothbrush, earbuds etc. but basics available. Wifi only in reception, bar and dining area. But fine, forces you not to be distracted and enjoy tranquility. The only negative is the ringing of cell phones of staff. During check in the receptionist cell phone rang 4 times loudly. It should be on silent and answered after finishing with guest. In the middle of the countryside, very peaceful set on and around a hill. Rooms basic but magnificent views from ALL rooms. Food here is excellent. The only negative - Bell boys rather unorganised. We had to find them to collect our luggage on arrival so we booked them to come and help for checkout - they didn't show up. We were late leaving for our train. It was not a huge problem just annoying as the boys seemed to be sullenly hanging about at reception doing nothing. The walks around the area are fantastic. Women hassling you were a bit of a nuisance but a firm "no" did the trick and they were not so pushy. One accompanied us on a walk and she was very helpful and deserved the purchase we made at the end of the walk. We asked her not to hassle us and she didn't. Very happy. 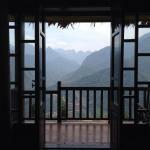 Topas is a wonderful place to stay near Sapa. We didn't want to be in Sapa town itself because it looked like it would lack the tranquility and space we craved. We were right. The town is lively, fun, and interesting, but the place to stay is Topas Ecolodge. The setting is perfect--spread across a mountain top with almost 360 degrees of breathtaking views. The comfortable cottages are charming and spacious. Best of all is that each has a balcony projecting out over the mountainside. The lodge offers lovely hikes, walks, and mountain-biking options, as well as terrific massages and bountiful, fresh, lovely meals. The Vietnamese coffee, sipped in an almost Alpine setting-is very memorable. Wifi is available in the central lodge, which is a very comfy place to hang out. The lower level salon has a wide veranda and an indoor bar serving coffee, tea and drinks. Sofas, a fireplace and ample board games make this a family-friendly spot. The upper floor of the lodge is a dining room with views of the surrounding countryside. Room tip: All are great. We stayed at the Topas Ecolodge for one night and really loved it. The bungalows are quite basic but very clean and I'm sure all of them have an amazing view! We loved lying in bed looking at the mountains. It's a really nice place to relax and just enjoy the setting of sapa as you are right in the mountains surrounded by all the rice fields. It's breathtaking! The only thing we didn't enjoy so much was the food. As said in previous reviews it is quite expensive and we didn't think it was great. It's a bit limiting as well because you must order the set menu for dinner so you've got no choice but to eat what is on the menu for the evening. Anyway other than the food we thought this place was amazing and glad we got to stay here! The northern highlands of Vietnam have a spiritual aura. What better place to stare in wonder over the beauty of the valleys than from the Topaz Eco Lodge. The lodges are comfortable and the site has a quiet, contemplative appeal. The close relationship that has been established with the local Red Dao tribe has created a mutually beneficial way of life for visitors and the local people. We loved this place. Room tip: The Eco lodges are not about what is inside them, rather what surrounds the small complex.